There are a number of reasons why so many visitors regularly flock to the south western city of Jerez, amongst them the very Spanish pastimes of horses, wine and dancing. But arguably the biggest attraction for many is the high octane motorsports action at the Circuito de Jerez. Equestrians come to Jerez to visit the home of the Andalucian dancing horses, while those who like a tipple or two can sample the delights of one of the many distilleries producing the world renowned sherry the region is famous for. The Andalucian centre of Flamenco is based here, and there is an annual dance festival held to celebrate the traditional Spanish dance. But Jerez and motorsports also go back a long way. Originally developed in the 1960’s the first Jerez track was home to early international motorbike championships. After Formula 1 racing ended at Madrid’s Jarama track in 1981, the Mayor of Jerez at the time decided to build a racing track that would bring F1 back to Spain. After years of development and hosting smaller events, the Circuito de Jerez held its first international motorcycle race in early 1986, hotly followed by its first F1 race in the April. In an eventful and memorable event, racing legend Ayrton Senna managed to fend off Nigel Mansell to take victory in one of the closest finishes ever seen in the sport at the time. 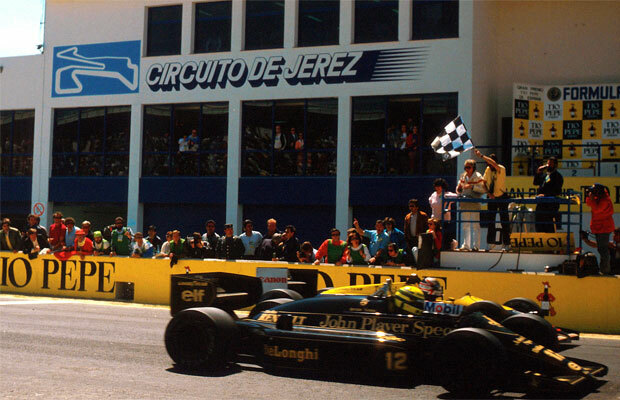 Jerez continued to host the Spanish F1 Grand Prix until 1990 when it moved to Catalunya. The circuit underwent a series of changes and went on to host both the 1994 and 1997 race, where Mika Hakkinen took his first F1 victory. Valencia is now home the European Grand prix, and while Jerez has not hosted an F1 event since 1997, it is still used regularly by teams for testing. In 1987, Jerez hosted its first Motorcycle GP, and has been a regular host of the MotoGP since then, and is considered one of the most demanding, exciting, and most important dates on the MotoGP calendar, welcoming 125,000 motorcycle fans through its turn-styles every year. 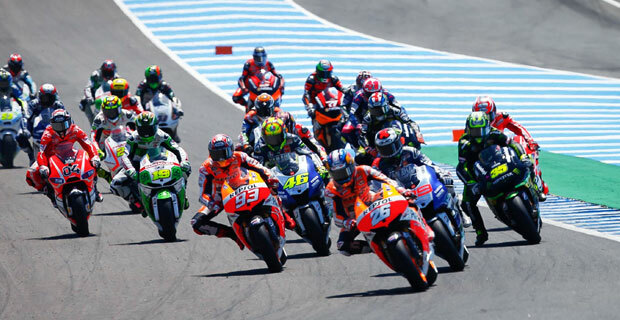 If you would like to attend a MotoGP race in Jerez, you are still in time! Buy your tickets online and enjoy one of the most exciting racing events in the world during the 2, 3 and 4 of May 2014. Race weekend in Jerez is extremely busy, with flights, accommodation and car hire booking out quickly. To guarantee the best rates and availability for your Jerez car hire, book your AurigaCrown rental car as early as possible to avoid disappointment.